From the minute you set foot on the island of Vvardenfell, you have the opportunity to become enmeshed in a vast number of expansive quest lines. Some feature world-changing, life-or-death choices; some tackle issues of politics and sociology; others are just plain lighthearted fun. But all are substantial, thought-provoking – and fully voiced. So if you’ve had concerns about the story of an online RPG being shallower than what you’ve come to expect from The Elder Scrolls, go ahead and put those concerns aside. Morrowind is positively crawling with story-based content. 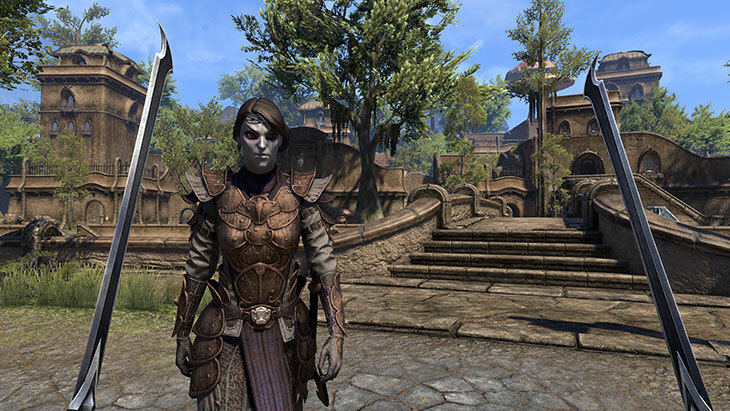 Though this new chapter in The Elder Scrolls Online takes place in Morrowind – the setting for The Elder Scrolls III: Morrowind – there’s no need to have played the earlier game to appreciate this one. None of the zillions of quests mentioned above assume any prior knowledge, so you can feel absolutely free to jump right in. 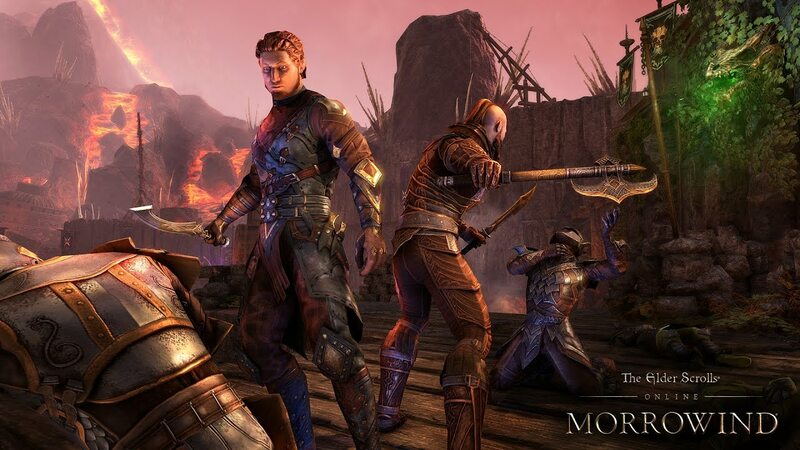 In fact, there’s no need to have played any Elder Scrolls game before jumping into Morrowind, because it’s designed to be a perfect entry point to The Elder Scrolls Online for everyone. 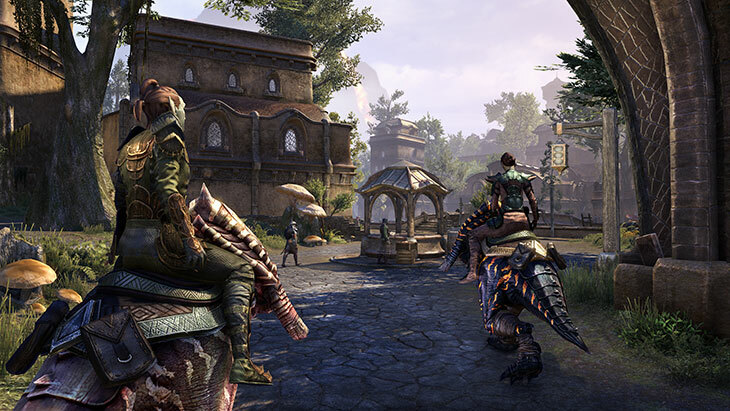 Whether you’re a total newcomer, a fan of the single-player Elder Scrolls games, or even a longtime Elder Scrolls Online player, you’ll find Morrowind to be an ideal place for a brand-new start. Now, if you have played The Elder Scrolls III, you’ll come across some familiar locations, familiar factions and even a familiar character or two. But The Elder Scrolls Online is set 700 years before the events of The Elder Scrolls III, so much of what you’ll encounter is drawn on a clean slate. 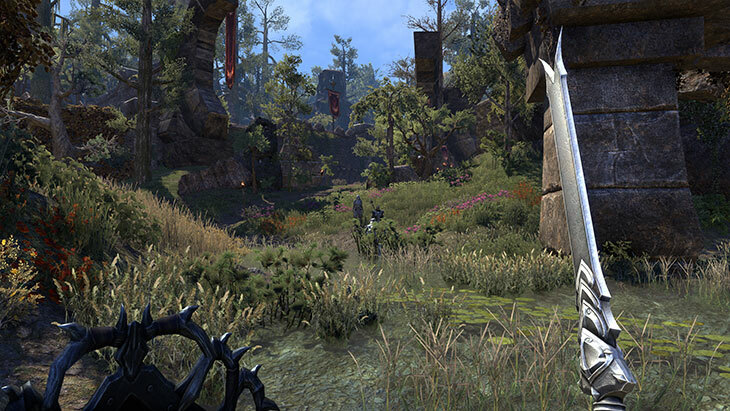 If you’ve been hesitant to jump into The Elder Scrolls Online because you prefer a solitary experience, never fear. Though it is a multiplayer game, it’s wonderfully accessible for solo players, and this is nowhere more evident than in Morrowind. The vast, vast majority of the content here can be completed by just one player, and the huge number of story-driven quests are perfect for those used to single-player Elder Scrolls games. Of course, you can still group up if you choose; the game supports a wide range of social features that facilitate everything from casual exchanges to full guild management. But it’s absolutely not required. 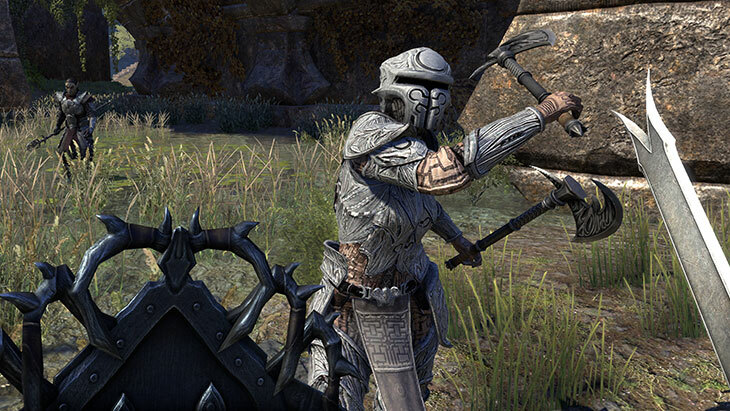 Thanks to the release of the One Tamriel content update in October, players no longer have to worry about being under-leveled for any particular area. The game now scales the basic stats of player characters to a level appropriate to the region they’re in; that means that when you step into Morrowind you’ll be starting out on the same basic footing as every other player. It also means you can group up with experienced players no matter your level. And best of all, it means you can freely wander the entire vastness of Tamriel without fear of getting demolished by an overpowered frost troll. So explore to your heart’s content, from Morrowind to Daggerfall to, yes, Skyrim. Though most of the interface for The Elder Scrolls Online will be very familiar to Skyrim players, combat includes a few notable adjustments. In addition to the standard attack/block system, The Elder Scrolls Online features an onscreen Action Bar where you can slot in any combination of spells and physical abilities. These supplement the standard attacks with your equipped weapon, but there’s a catch: Each consumes either Magicka or Stamina, and some take some time to activate. That means you need to plan ahead just a bit more than you might be used to, making sure you have enough of the necessary resource to fire off these powerful abilities – or enough time for your Magicka or Stamina to recharge – and enough time to execute them. Combat also features a few other adjustments to the Elder Scrolls formula, like the ability to interrupt some enemy attacks, leaving your foe vulnerable to powerful counterattacks. 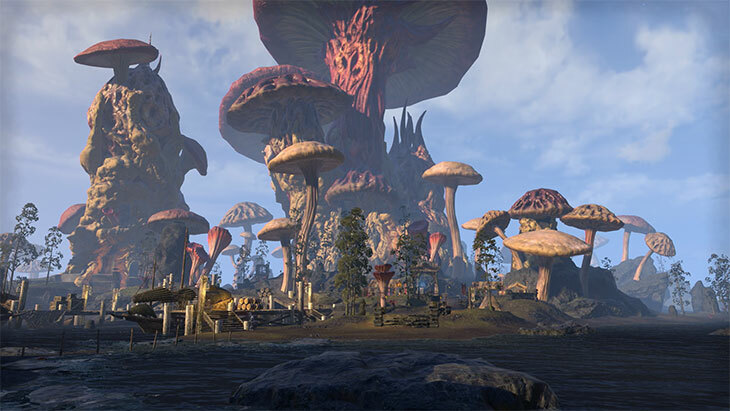 But getting the hang of these new features is a cinch, and Morrowind offers an extensive tutorial section to gently ease you into the new systems. Don’t make the mistake of thinking that fighting is all you’ll be doing in Morrowind, though. It’s not even all you’ll be doing in the course of following the game’s varied quest lines. Vvardenfell is, after all, a land of complexity and intrigue, with a number of different forces at play. Many of Morrowind’s quests play off the kind of thought-provoking sociopolitical conflicts that helped make Skyrim so memorable. 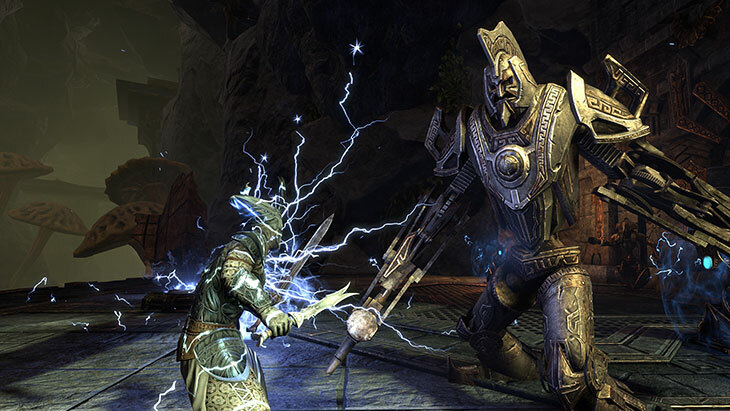 But even beyond questing, The Elder Scrolls Online has lots to offer that doesn’t involve combat. A deep crafting system lets you create everything from armor to furniture. The social features offer loads of ways to interact with other players. Fans of Skyrim’s Hearthfire DLC will find much to love in the new Homestead DLC, which lets you buy and furnish your own house – even with items you’ve crafted yourself. And Vvardenfell offers countless opportunities for pure exploration, with countless valuable things to discover off the beaten path. Long story short: Though the massively multiplayer format makes for some differences, this is unquestionably an Elder Scrolls game. 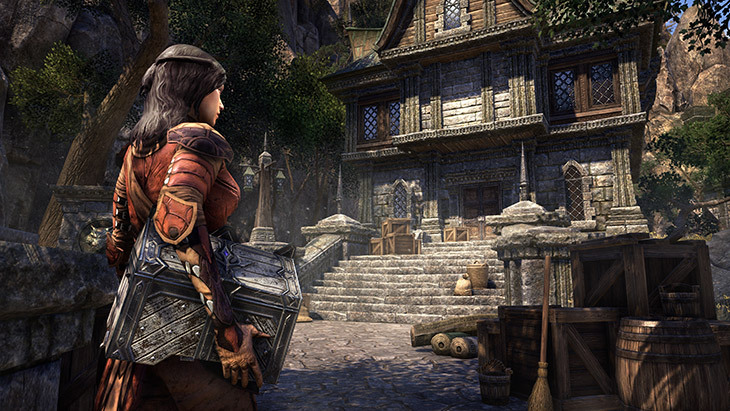 That means you’ll encounter familiar races, from Khajiit to Argonians; you’ll explore familiar places, from Dwemer ruins to Daedric shrines; you’ll encounter familiar factions, like the Thieves’ Guild and the Dark Brotherhood. There are books to read, treasures to find, dungeons to delve. 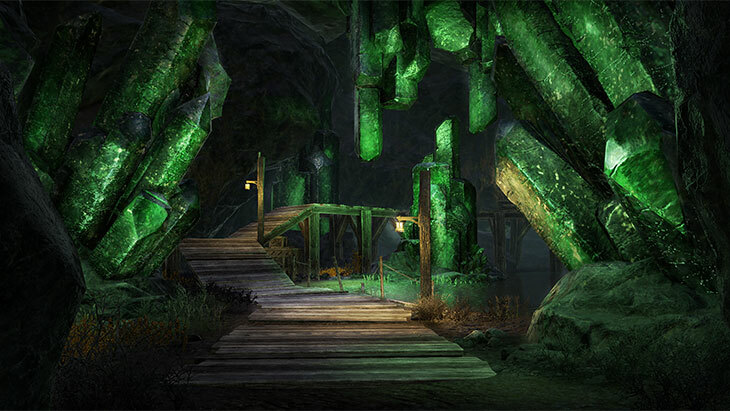 And once you’ve explored all of Morrowind, there’s all the rest of Tamriel to discover – including Skyrim itself. Yes, Morrowind is just one part of the enormous version of Tamriel that you’ll find in The Elder Scrolls Online. And with every province as packed with content as Morrowind is, even the staunchest Skyrim completist will have enough to keep busy for a long, long time.